The Jewish community of western Ventura County gathered on the eve of Purim to kick off the merry celebration in Oxnard on Wednesday. More than 150 adults and children rang in the holiday, celebrating community and love with a little humor. As the first part of the two-day holiday, Wednesday's celebration observed the Purim miracle that occurred more than 2,000 years ago. The Jewish people were able to overcome a decree in ancient Persia to kill all the Jewish people in its provinces, according to Rabbi Dov Muchnik of Chabad of Oxnard. "The lesson is that everything happens for a reason. Even if it is by chaos, there is always a plan," Muchnik said. "We do not always understand the plan at the time, but it ends up being positive. God is often concealed not only in the Purim story, but in the life around us." Hosted by the Chabads of Ventura, Oxnard and Camarillo, Wednesday's event was at Herzog Wine Cellar in Oxnard, a venue that makes kosher wine. Participants packed a private event room for a festive reading of the Purim miracle from the Book of Esther. Wine tasting and hors d'oeuvres followed the reading. Cynthya Neftin, of Oxnard, attended the event with her two children to pass on the tradition. "Being a part of the community is important, especially with children," Neftin said. "I was raised Jewish, and I feel it is important to continue the traditions and religion." On Purim day, the Jewish community continues the celebration of what can be described as the opposite of Halloween, according to Muchnik. Participants give gifts of food and charity to family, friends and others in the community. Children dress in positive costumes. They participate in another reading of the miracle and feast. 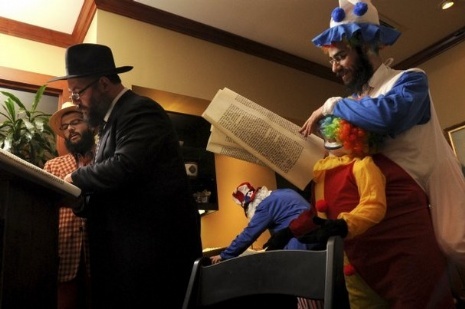 Each Chabad held its own carnival-style celebration. "The idea is for people to come together, remember and be happy," said Moshe Shmuel Gano, 20, of Camarillo. The Chabad Hebrew School kicked off the eve event with a song that summarizes the miracle. Rabbi Mendy Lubin from Chabad of Ventura read Purim story in Hebrew. The audience listened quietly for the mention of Haman. The crowd of people booed and made a racket with noisemakers, horns and bells when Haman's name was read. A slide show on a big screen projected a visual story of the book of Esther with figures from the story comically depicted as modern-day characters, such as Darth Vader from "Star Wars." The crowd spoke certain verses in remembrance of important parts of the story. Participants broke into song at the end of the approximately 30-minute reading. Those over 21 years of age participated in the meet-and-greet wine tasting. "We had a phenomenal turnout," Muchnik said. "It's not one of the major holidays where the significance of it is major. This is a more minor holiday, but when many people gather, it is special and heartwarming."